Grace Potter at Joe's Pub in New York City. Last night singer Grace Potter, best known as frontwoman of Vermont-based band Grace Potter and the Nocturnals, performed a private acoustic show at Joe's Pub in the East Village. 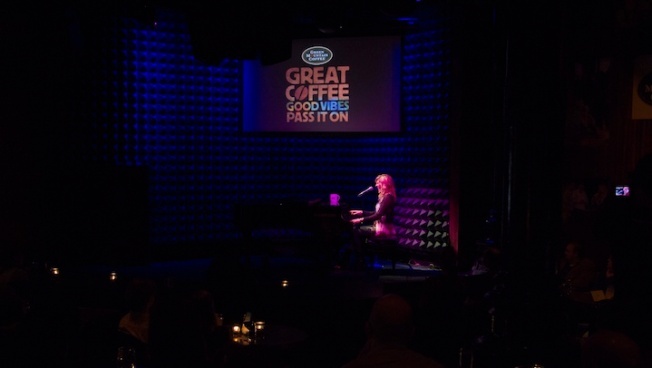 She rocked for a full house with a solo set and introduced the crowd to the "Great Coffee, Good Vibes, Pass It On" campaign to increase the awareness of fair trade around the world. With just a piano and guitar, Potter's powerful voice filled the room. Singing crowd favorites "Apologies" and "Paris," the singer entertained with a standout show in the intimate downtown space. Potter has teamed up with Green Mountain to spread the word on fair trade and how it positively affects farmers by bringing fans exclusive special performances. Last night's outstanding show definitely brought about good vibes. To learn more about Grace's cause and fair trade, visit Facebook.com/GreenMountainCoffee.